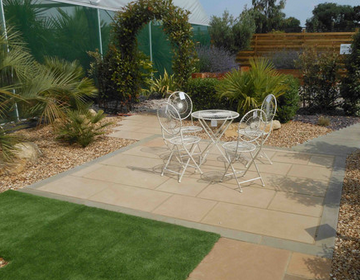 Alfresco Landscaping have teamed up with Olive Grove Nurseries of Oundle to create 2 show gardens to underline our capability of design and construction. The gardens are part of the lifestyle experience that is offered at Olive Grove where you can enjoy the deli, coffee shop, traditionally baked pizzas and ice cream parlour as well as the extensive stock of specimen plants, Olive trees and palms. There is the largest selection of Olive trees in the UK plus an interiors section and Clothing shops. Through 2 small gardens we have underlined how you can utilize a relatively small space and create something beautiful. The Contemporary garden utilises Graphite porcelain paving surrounded by wood effect porcelain. The planters are faced with cedar battons which will slowly silver off in the sunlight. A mixture of Scottish cobbles and plum slate with large Glacial boulders as the focal stones set off the palms and Acers. The Mediterranean garden has more muted buff porcelain paving and more locally sourced aggregate and larger Limestone rocks. Utilising the palms and acers this is a peaceful scene that would fit any small garden. Woburn rumbled locks and Natural sandstone in Sunset Buff complete the pallet of materials that demonstrate a cross section of the Bradstone range. The beauty of both of the gardens is that they are completely scalable and when combined with lawns, borders and walkways they can act as small pockets of a much larger scheme.